The idea to include community gardens within Baltimore’s parks developed later, according to McCray. Former Mayor William Donald Schaefer suggested a garden network, beginning as a horticulture division of Recreation and Parks which became City Farms. In 1978, the first City Farms garden, located in Clifton Park, took root. “The City Farms program is pretty much, now, a collaboration of several entities that are interested in developing the neighborhoods in the city with the City Planning Commission fully involved,” McCray says. Part of Mayor Schaefer’s plan in creating the community gardens was to elevate the community and give visibility to the notion that Baltimore is on the rise, recognizing its allegiance to its citizenry, according to McCray. And its citizens were pleased, he says. “People were leaving the city because economic advantages were not here, but that exodus has been averted due to City Farms and like-minded programs,” says McCray. Overall, the gardens are rented space. Individuals as well as various groups such as churches and non-profit organizations have the responsibility to work their particular gardens. Some of the organizations and non-profits are geared toward providing food for the homeless, according to McCray. How each garden is managed is handled on an individual basis, according to McCray. City Farms receives funding via many sources, says McCray. City Farms provides gardens with wood chips for walkways as well as mulch and compost, according to McCray. 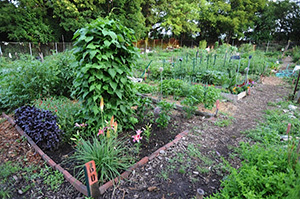 Though communal gardening supplies and tools are supplied by City Farms, McCray says that many prefer to outfit their gardens themselves. According to McCray, the newest City Farms addition is Upton Garden. There are always issues to deal with, according to McCray.